Thanks to all of you for the overwhelmingly positive response you’ve given to my recap of the experience in court last week entitled “Injustice in the Courtroom.” It encourages me to see how many of you feel both connected to the experience of this young woman as well as outraged at the fact that it happened in the first place. A handful of you have also donated to help with her legal funds as well, and that has been really special (if you are interested in doing so as well, feel free to email me at dhill@rivercitychicago.com and I can explain the process that we have set up). Her story has touched a national nerve in a way that neither of us expected. It is clear that a movement is already growing to fight against racism in the national incarceration system, and her story seems to have become an iconic example of this fight for many (as an aside, if you haven’t read Michelle Alexander’s The New Jim Crow yet, I would highly recommend you do. It’s the fastest way to get in touch with the national movement around this). I was processing this on Saturday with Rev. Dr. Brenda Salter McNeil, who is one my most trusted mentors. As we talked through the unjust treatment, Rev Doc reminded me of something that I haven’t thought about in a while. She contrasted the experience of this young woman and the treatment she received with the experience I had as a young man and the treatment I received. The darkest period of life for me was high school. I struggled with so many things – insecurity, fear, depression, hopelessness, etc. There were lots of factors that contributed to this. I was the oldest of 5 children caught up in a contentious custody case. I switched schools 4 times in 5 years. I was physically small and lived in a violent neighborhood, so I was beat up constantly. I had no sense of self esteem, and wondered if I would ever do anything that mattered. I was struggling spiritually, emotionally, physically, and psychologically. I had a small group of friends that I felt at home with, and they were the one thing I felt tethered to. But after we graduated high school they went away to college, while I stayed home. I was paying for college by myself, and though I badly wanted to go to U of I, I couldn’t afford it. So I settled on the University of Illinois in Chicago (UIC) instead. It was local, fairly inexpensive, and allowed me to commute from home. This may have been the right choice for financial reasons, but it had unintended consequences. I was isolated from the only friends that were meaningful to me, and loneliness and despair reached a new level during my freshman year. I reacted in all the wrong ways, and things got really bad really fast. There were a number of self-destructive activities that I began to engage in, but none was worse than becoming a thief. It started small, but quickly escalated. I still remember the thrill I got the first time I stole a trinket from a ma-and-pa shop. The price tag was only .99¢, but that didn’t stop me from feeling like I had pulled off the coup of the century. In some really jacked up way, it gave me a sense of accomplishment. I had taken the system head on, and I had won. The desire to beat the system took on a life of its own. I began stealing increasing valuable things, just to see if I could get away with it. I consistently did, and I felt a growing sense of value from my ability to operate within the underworld. At a later point someone asked me what I planned to do with all of the stolen merchandise, and I confessed I had never thought that far ahead. I wasn’t trying to hurt anyone, and I wasn’t even trying to make money. It just felt good to be special at something, and I seemed to be special at stealing. 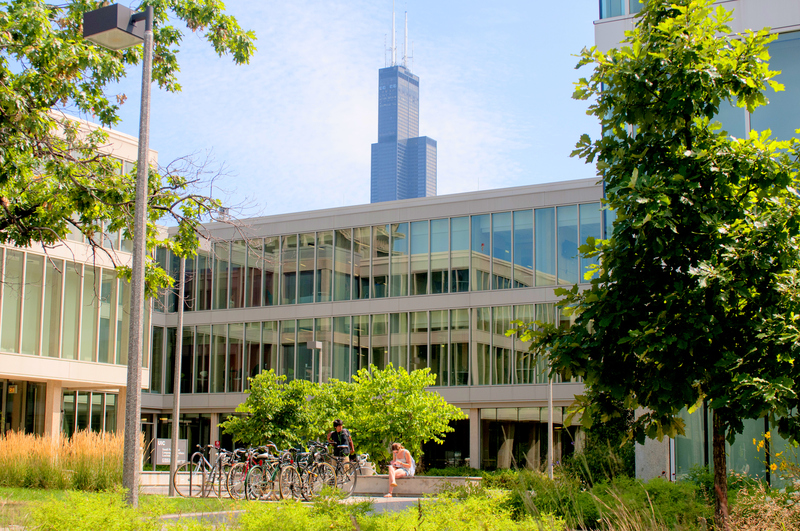 I was a freshman at UIC during this time, and my experience there was an utter disaster. I don’t blame them for this – it was all me. I felt alone and overwhelmed there, and I had no emotional resources for dealing with whatever was happening on my insides. So instead of finding a healthy way to deal with my sorrows, I did the worst thing possible. I decided to take it out on UIC in the only way I knew how. I would showcase my growing expertise in the criminal world. I was having a particularly bad day one week, and decided I would walk into the UIC bookstore and case the joint. Within minutes I had figured out how to pull off a serious caper. All customers were required to check in their book bags when they came in, but the security setup was poorly designed. The bookshelf where you self checked your bag was located between the pair of cashiers that worked there, and both of their backs were to it. In other words, the only security precaution installed was in a complete blind spot. My plan was quite simple. I would come in with an empty bag, and leave it in this huge blind spot. I would walk around and decide what I wanted to pilfer, and then fill my empty bag and walk out. It was way too easy, and I decided that I needed to do it again… and again. I made a dozen trips and stole an incredible amount of merchandise. I finally got bored and decided to call it a day. When I got home that night and opened my car trunk, I marveled at how I had pulled this off. Sitting in there were 10 leather jackets, 20 varsity sweatshirts, and a vast assortment of random other merchandise. I felt like I was unstoppable. The problem was that I was in a rapid death spiral, and I had no self awareness about it. I was feeding this jacked up, broken part of me by successfully stealing stuff, and it was such a disaster. Something needed to happen to break me out of this terribly self-destructive path, or else I was going to end up dead or in jail for a really long time. When I came back to school the next day for class I walked past the UIC bookstore. A voice inside of me told me to keep going – if the goal was to prove that I could game the system, then I had made that point loud and clear the day before. But another voice – ironically, I think this was God – told me to go back for some more. When I did go back I did something that was absolutely insane. I didn’t follow the meticulous plan that I had devised the day before. It wouldn’t have ultimately mattered, because they were waiting for me, but I still shake my head at how audacious I was. It had taken almost two hours to pull off the caper before, but today I decided it should only take two minutes. I went in, saw that they had restocked the leather jackets, and picked up 6 of them. I threw them over my shoulder and walked straight out the door. What was I expecting? I’m not sure. Maybe I had become so self-delusional that I thought I could do whatever I wanted without consequence. Somehow or another I had convinced myself that I could just walk right out of the UIC bookstore without any repercussions. Well that’s not what happened. I didn’t get one foot out of the store when I saw two Chicago police officers waiting for me. They handcuffed me in front of all my fellow students, and instantly the scales came off my eyes. I realized that I had been living a lie and going down a path of absolute self-destruction, and that my time had now come up. I had been caught with $2,500 dollars of stolen merchandise (in addition to the jackets I had 100 high end pens that cost $7 each), and I was about to pay the piper. Life was about to get really, really hard. Whatever demons I had been wrestling with at the internal level were about to turn into something exponentially worse. I was probably going to do serious time for this. The two cops that arrested me knew that I had been the one that robbed the bookstore the day before, but they couldn’t prove it. That didn’t stop them from inflicting their own sense of justice. One cop in particular was a nightmare for me. He tried everything within his power to provoke me into a reaction that would justify him giving me what I deserved. He cussed, he swore, and he called me names. He mocked and insulted me. He told me that before the day was over I would have blood dripping down the back of my legs in jail, and that I would pay for my sins. This lasted for about two hours, and when it was clear that I wasn’t going to respond they finally brought me into the local jail to process me. This is where the story became crazy, and where I experienced life changing grace. It just so happened that one of the officers was white, and one of them was black. It was the white officer that had antagonistically provoked me for two hours, and that seemed hell bent on inflicting his own brand of justice. But it was the African American officer who came and sat next to me on a bench while I was being prepared for incarceration. I thought I was in trouble again, but he surprised me with what he asked. I honestly had no answer to this question. It would be years before I was emotionally processed enough to understand all what was happening in my soul during that era. I told him that I genuinely didn’t know. It was if someone else was living my life through me. I was at a loss. He seemed to believe that, and what he said next was so compassionate and tender. A tear formed as I listened to his words. Who was this guy that could look into the eyes of a guilty criminal that had just robbed his own school’s bookstore, and say something like that? How was it that he could see my true heart, even as I had just screwed up so royally? It was moving. I couldn’t think of anything to say, so I just soaked in the words. I was certain I was going to be in jail for a while, and I was scared. But somehow I sensed the presence of God through his kind gesture. I don’t know what got into that cop, but he decided in that moment that kind words weren’t enough. He decided that he needed to do more, and headed off to go advocate for me. He went and talked to his sergeant, and I could overhear most of the conversation. He conveyed the same thing to him that he had just said to me. He told the sergeant that I was a good kid and that I didn’t belong here. He told him that they needed to look out for me, and make sure that I didn’t get hammered by the district attorney who was already preparing the case against me. The sergeant wasn’t sure why the officer was making such a big deal out of this, but he told the cop that if he wanted to call the DA and make a case for me he was welcome too. I heard the whole conversation between this officer and the DA who was scheduled to prosecute me. My mouth nearly dropped to the floor in shock as I heard him persuade her to drop the charges from a felony to a misdemeanor. He convinced her that I was a good kid who could be permanently placed behind the 8-ball with a felony conviction. He convinced her that a felony would permanently ruin my job prospects, and that in his opinion, I had already learned my lesson. She agreed, and dropped the charge to a misdemeanor. I spent 36 hours in jail, and then went straight to court to be sentenced. The judge was surprised that the charges were reduced, but he didn’t fight it. He gave me 3 years of supervision and told me that if I so much got caught with a joint in my possession that I would go to jail for a very long time. He could have given me 30 years of supervision and I would have been thrilled. This encounter had snapped me out of my extended funk, and I was certain I would never entertain a criminal thought again. And I never did. I returned everything I ever stole, and committed to walking the straight and narrow path from that point forward. As the years have passed I have thought about that tragic week often. What a fork in the road that was. I was on a self-destructive path, and I made a set of bad choices that should have landed me in jail with a convicted felony on my record. And that could have just been the beginning. I was in such a fragile, broken place, and I don’t know how I would have survived that. It could have sent me down a path that I may never have recovered from. But because someone in law enforcement saw me, had compassion on me, and advocated for me, everything changed. That African American cop showed a level of grace and compassion that I will never understand. And though I don’t currently know him and he doesn’t know me, I can’t wait to meet him in Heaven someday. I can’t wait to tell him about the way he redirected the life of a lost and wayward soul. This is the first time I have ever publicly written about that life shaping period of my life. It’s somewhat embarrassing for me, as I fear that when people hear it they will think I shouldn’t be a pastor now. However, I have told a lot of friends this story in a 1-1 context, and I’m always surprised by the response. Usually they don’t even talk about the mistakes I made. Instead, they tell me about some similar period in their life. They share about a time where they made a huge mistake themselves, and talk about how badly things could have gone for their future if they had not received some type of break themselves. I committed a huge offense, and yet received sympathy, compassion and grace when it came to the punishment. She committed no offense other than responding to some rough bouncers, yet will carry a pair of convictions with her for life. I had someone in law enforcement advocate for me, even though I didn’t deserve it. She deserved to have someone in law enforcement advocate for her, yet nobody came to her side. When I came face to face with the system, the system saw someone that made a mistake and demonstrated leniency. When she came face to face with the system, the system saw someone that was dangerous, menacing, and needed to be made an example of. When those who had power heard my case, they felt sympathy, and they gave me the lightest punishment possible. When those who had power heard her case, they not only gave the harshest punishment possible – they went even beyond the reasonable boundaries of the law. My encounter with the law turned my life around. It convinced me that I mattered, that my choices mattered, and that justice was real and helpful. Her encounter with the law reinforced a historical and terrible narrative. It portrayed her as a threat to society, and took it upon itself to teach her a “lesson.” It left her wondering whether there really is justice or if the system is so rigged that even a single mistake can turn into a life sentence. That is why her story is so moving to me. I can identify with it at such a deep level. I made a series of mistakes that was a hundred times worse than hers, and ultimately got nothing more than a slap on the hand. She made a mistake of defending herself in a culturally inappropriate way, and will now have to spend the rest of her life trying to convince leaders in the social work field that they shouldn’t hold her two convictions against her. Actually, she received Supervision and if she keeps her nose clean during her supervision period, she can have the charges against her dismissed. That’s how supervision works, especially with misdemeanors. It is not a judgment against her. Ask any attorney worth their salt. Actually, she could have been sentenced to DOC time if the jury hadn’t acquitted her of the felony charges. To get Supervision, which was what she was offered in the first place, is not the harshest penalty. You’re inflating this circumstance. . . and I’m wondering why. It seems to me a white preacher is exploiting a young black woman’s situation to garner attention for himself and he is inflating the facts in the case to serve his purpose. The powerful and the stupid have one thing in common. They don’t alter their views to fit the facts. They alter the facts to fit their views. Wow, Thaddeus. I’m saddened by your insinuation that the motive for sharing this important information about the racial disparity in the criminal justice system is simply for a white preacher to “exploit a young, black woman’s situation.” As an advocate for reconciliation, I believe that we cannot discuss difficult topics like this if we assume that we know what’s in another person’s heart and won’t listen without bias. That type of prejudgment hinders civil discourse and I hope you will refrain from it in the future. Regarding your point about the young woman “receiving supervision” and our need to check the facts, here is what I understand to be true: Four charges have been dropped and she has received supervision for them. I believe she will “keep her nose clean” as you suggested and these misdemeanors will eventually be dropped from her permanent record. However, she was CONVICTED of the two more serious charges of “resisting arrest” and they will remain with her and follow her for the rest of her life, unless they are overturned by appeal. This has serious implications for how she will be viewed by society and potential employers in the future, The charge sounds much more serious than what actually happened and has the potential to negatively impact her ability to put this horrible experience behind her and to move on with her life like Daniel Hill was able to do. I think that was the point of his very honest and insightful blog and I commend him for taking the risk to write it. Let me just clarify something. Supervision does not get dropped from your record even if you keep your nose clean. They theoretically cannot be used against you in a future trial, but they will not be dropped from your record. Second, and more importantly, I’ll attest to Daniel’s character. If Daniel is trying to garner attention to himself, he’s doing a horrible job. I never said the case was dropped. I said the case could be dismissed after the completion of the supervision period, if applied for by motion. And after that, there is the expungement option, as well. At that point, she can file to expunge that record at which point it would be – if the expungement is allowed – destroyed and not on her record and she wouldn’t have to acknowledge it if asked by a future employer. Essentially, dropped. So let’s do a little primer on terms so that we are on the same page! Supervision is a court order holding the case open for a specific period of time, usually between six months to two years. During that time, no judgment of guilt is entered. If all the conditions of supervision are followed, the case is dismissed and NO CONVICTION is ever entered against the defendant. WHAT IS NOT A CONVICTION? // Court supervision, nolle prosequi, acquittal, stricken off with leave to reinstate, findings of no probable cause, dismissal, not guilty, or successful completion of First Offender Drug offenses receiving TASC probation are eligible for EXPUNGEMENT. So d2frette, you are right. . . to a point. When supervision is completed, the defendant will still have a record but there will not be a conviction in the case. Court supervisions are not considered by the courts to be convictions. If supervision is completed successfully, the defendant WILL NOT have a conviction on their record. They will still have a record – namely the arrest and the charges, but no judgment against them. BUT THERE IS HOPE!!! If supervision is completed and no conviction is entered due to that completion, the defendant must wait for two years after the completion of that supervision to file for EXPUNGEMENT of that record of arrest and charges. WHO QUALIFIES? // Defendants with acquittals, dismissals, and with supervision completed successfully. Daniel, it takes a lot of courage to share this kind of story. This is exactly why you should be a pastor. You’re a good one! If there is any error in the stated facts, I’m sure Daniel would be the first to jump in and make the correction. Perhaps it would be helpful to consider what his “purpose” was when he initially wrote about this, which was prior to the court case, when his heart was breaking over what this young lady had been through and was still going through. Why did I say I might be considered biased but that I would stand by my belief in the purity of his motives? Because I’ve known Daniel for over 40 years. I know who he was, and I know who he is. I know that he has a great love for God and a big heart for God’s children, especially those who have suffered, as this young lady has. He is my son, and I couldn’t be prouder of him. Thaddeus sounds like a lawyer. Ironically, it also sounds like he “altered the facts to fit his views”. Not sure if that makes him smart or stupid, but either way Dan’s skin color has nothing to do with this. People of all colors should be concerned and willing to express and expose injustices for people of all colors. What if Daniel Hill was black? Either way, Daniel is a pastor not a lawyer. Provoking this dialogue is necessary. It Thaddeus thinks there are not two systems of justice in this country in which black people are treated differently than whites – as evidenced by Daniel’s personal experience – then he ought to watch the news every day. Does the name John Burge ring a bell? Just askin’. Right on, Phil Hayes, especially that “People of all colors should be concerned and willing to express and expose injustices for people of all colors.” That really is the bottom line. If we keep “provoking this dialogue”, as you said, and work together, maybe we can right some of these wrongs. Years ago I had an experience very similar to that of Daniel. After a fairly long and successful “career” as a shoplifter, I was finally caught by a store security guy, who saw me on camera. The police were summoned. I was not even arrested and taken to the jail to be booked. The police officer, at her discretion, wrote up my crime as a violation of a city ordinance rather than of state law, and gave me a “notice to appear”, which is like a traffic ticket. There was and is absolutely no doubt in my mind that, had I been a black male, I would not have received such lenient treatment. I was able to plead guilty by mail and pay a fine. As soon as legally possible, I paid a small court fee and got my criminal record “sealed” (not expunged – there’s a difference). While the whole experience was quite traumatic and taught me an important lesson about the dangers of running afoul of The Man, I have no doubt that the trauma would have been significantly greater had I been black. And had I been black, this would have been only one incident in a lifetime of cumulative trauma. There are definitely, beyond any shadow of a penumbra of a doubt, two separate and unequal systems of justice in the United States. And I say that as the white beneficiary of the two-tiered “justice” system. I fervently hope that, as Thaddeus suggests, the young lady’s “crimes” will somehow disappear and not be held against her in the future. I hope she will go on to lead a happy and successful life, surrounded by compassionate people who love her. But the trauma she has experienced will remain, and the lessons she learns about the system will be quite different from the ones that Daniel and I learned. Hi “law”. When you posted your comment, you were probably requested to provide your name and email address. Below that information are two boxes that can be clicked, ‘Notify me of new comments via email’ and ‘Notify me of new posts via email’. You can check those boxes and you will be notified by email when other comments/updates come in. If I’m missing anything or if there is another method, subscribers please advise. Thank you!